1766 at a Vestry Metting it was agreed that Mr. William Edwards shall stop up the pathway in Mrs. Newbury`s field leading to the Sea and that if any Parishioners shall call the said Edwards to account for so doing he shall carry on the prosecution at his own expense. The earliest Indenture is 8th July 1892 between Richard Hodges of Bournemouth, Butcher and richard Shelton of Wolverhampton and Sarah Talbot of Eddington,mWarwickshire, for loan of £2000. 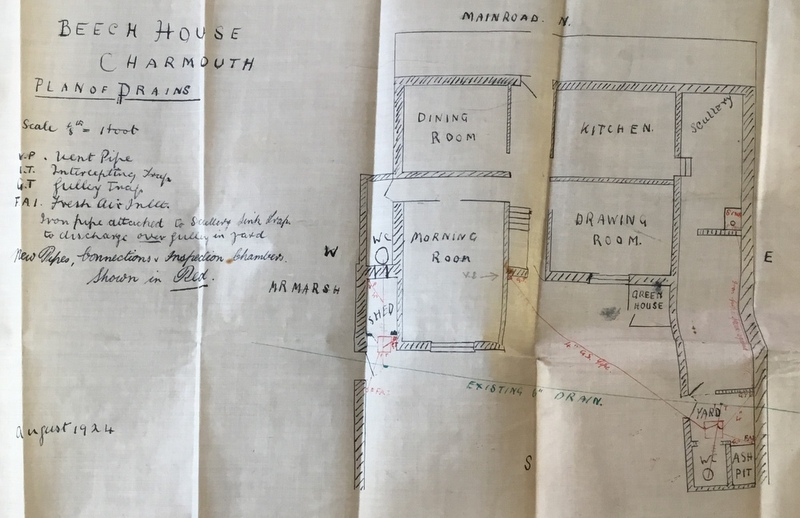 Property described - dwelling house divided into two tenements on south side of Main Street with the ground in front and a garden behind formerly in the occupation of Miss Puddicombe,tenant to Issac Cooke and afterwards of several years in occupation of John Hodges and which tenements were formerly in occupation respectively of Robert Manley and Abercombie, and now of John Paterson and Francis Radford. Also the plot of ground above and between the" Mail Coach inn" and extending back from the Main Street to the same depth as in the garden of the said Messuage. All this whole premises were purchased by R. hodges of Francis Cronin or his trustees. 9 July 1921 purchased by Alice Geraldine Haggard, widow. 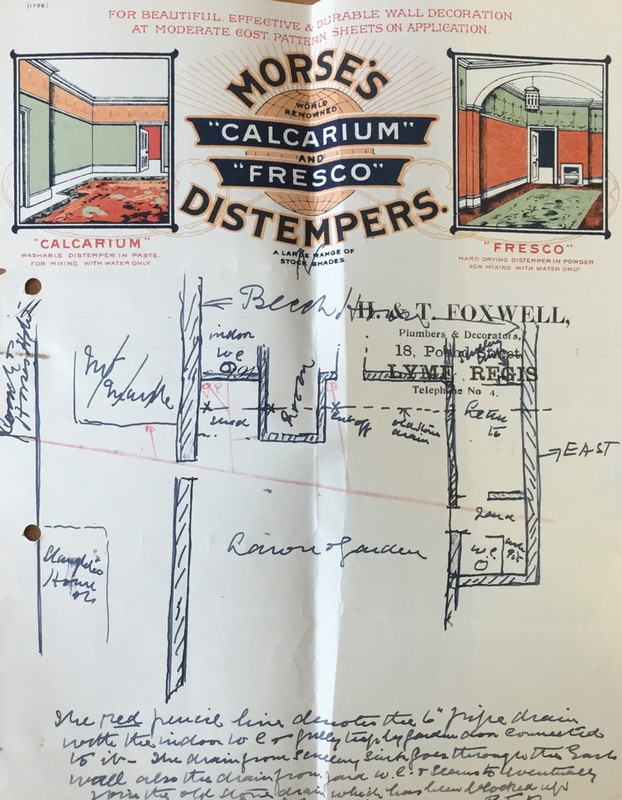 With eight to pass,repair over the passage or way between the points marked a,b, & c, on plan for purpose of delivering coal, wood and garden requisites. June 24th 1922 purchased by Godfrey D.N, Haggard. Haggard on April 3rd 1969 Sir Godfrey Digby Napier Haggard aged 85 late H.M. Consular service, beloved husband of Georgiana, funeral Broomfield Church, Thurdsay April 10th 3,p.m. John , son of John and Sarah baptised 1766! Ellen b. 1853 owner of Sandgord Cottage, inns in the yard. died 1874 aged 64 father John, married jane, father of william and charles , owner of cow stalls site of almshouses. Mrs Scalch of the Court purchases a field in 1864 on which stood a cow shed belonging to John Hodges a butcher, and goes on to build two almshouses to accommodate six poor people. 1837 Charles, born to John and Jane in Charmouth. 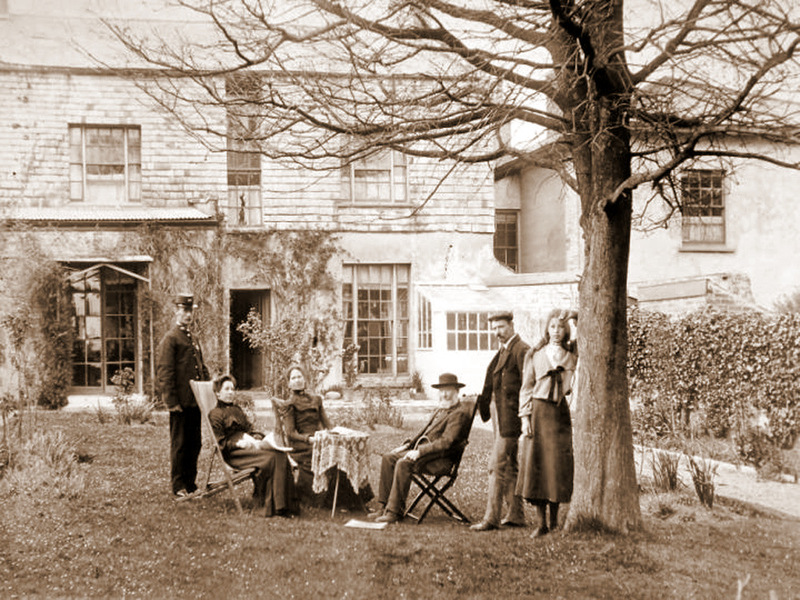 Mr and Mrs Thomas Larcombe and their family with Tom Long the Postman from Lyme Regis sitting in the garden of Beech House. The lady on the left is Mrs F. Marsh whose husband ran the butchers in the adjoining property. Carium House is seen on the right of the picture. Hannah Newberry rented the 2 acres field from the Church as it was originally Glebe Land and appears to have purchased it by 1780 and then passed to her Grandson on her death in 1790. He was a butcher and it seems to have passed to John Hodges a butcher by 1841 when he is shown as renting it from the church. He must have owned it when he had 3 houses built on it. The first owner of Sandford Cottage is George Hodges and his sister Ellenore, who was the 2nd daughter of John, the butcher.HE lived in a hbouse rented from church on tithe number 217 and rented the fields around it. John; HODGES; 30; Butcher;Jane; HODGE; 25,Wm; HODGE; 4,Chas. ; HODGE; 2,Eliza; HODDER; 18; Female servant. He also owned a house(t.no.1)that would become the Royal Oak and had been a butchers run by the Loves.School was supposed to be built on hodges buildings. 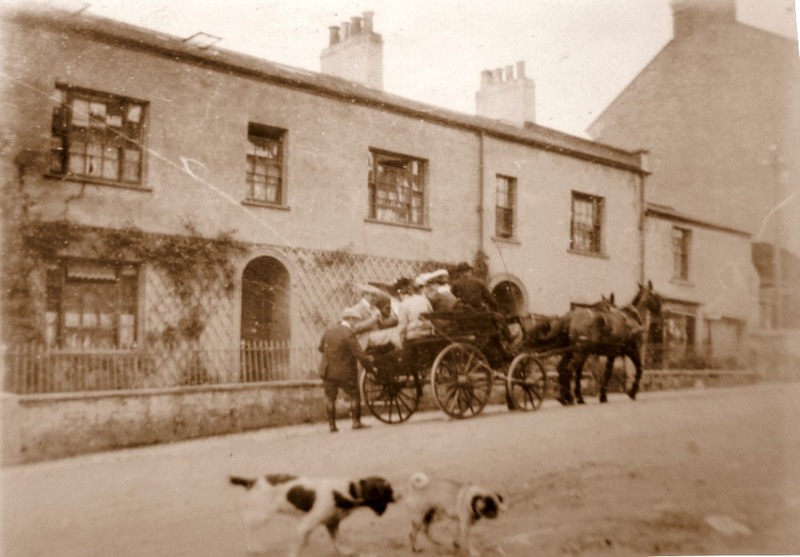 on 1837 jury List as butcher, william edwards dies in 1829 and Inn bought by Gundrys. "Sandford Cottage" stood on the corner of Sea Lane. The first owners that I have notes of are George Hodges and his sister Ellennore 2nd daughter of John, the butcher. At the beginning of this century it was occupied by Miss Baxter and her niece Margie, who told me that she was descended from the old Saxon Kings in England and from Malcolm III in Scotland and the French King Pcpin le Bref. On the unofficial side, her grandfather Pierre de Ilaceritz, private secretary the Tzarina of Alexander II, was the son of a Russian Duke and a German Princess. The Tzar was extremely angry with the princess into a convent and took the baby himself to be brought up almost like royalty. Maceritz's son married a Scotswoman and Margie was born in the Winter Palace, but her mother could not endure life at the court and with the Tzar's permission withdrew with her children to Switzerland. Her mother died in Italy and her father was drowned when the "Mohigan" was wrecked in 1898 off Jersey. 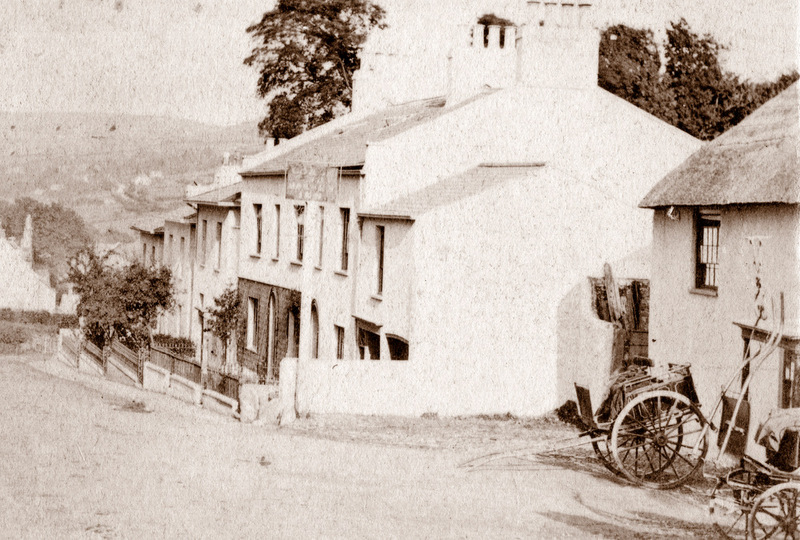 When Miss Baxter left,"Sandford Cottage" was owned by Mrs.Birkett whose daughter married Colonel Campbell Little. When the Colonel retired they lived in the house for many years, and Captain Brock Birkett R.N. lived with them. Mrs Little exhausted her strength during the 1939-45 war by her work for the British Legion and W.V.S, and died suddenly in 1949, Col. Little died shortly afterwards in 1958 and the house was purchased by the Dorset County Council and pulled down to improve the entrance, to Lower Sea Lane. "Beech House" The interior shows that formerly the two houses were one as on the ground floor part of the building seems to have belonged to the butcher's and the butcher's attic extends over Beech House. In 1892 Richard Hodges sold it to Richard Shelton who died in 1921 and it was purchased by Mrs. Haggard with right to use the garden door. In 1922 Godfrey D.N. Haggard, her son, became owner. He was father of Stephen who became famous as an actor but unfortunately died young. "Clarence Villa" now called "Carrum". In a memorandum by Samuel Dunn in 1844 he undertook to build a house for Miss Henning, which he let to her for twenty five pounds a year complete with garden and a pump of water. Miss Eliza Henning died in 1854 and Sophia Henning, who was blind, died in January 1886. During the 1920` s Charles Hodges lived here, who left £1,000 to purchase the Playing Field, he died in 1932 aged 92. 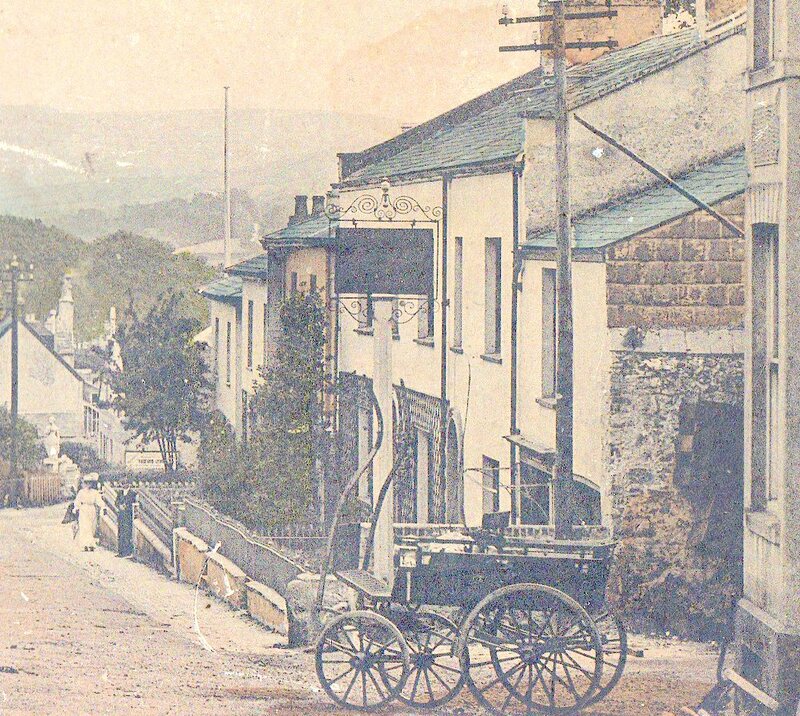 It was then occupied by Peter Marshall who introduced electric light in the village. His engine and dynamo were in the corner of the playing field and proved a great success until power from the grid took over. The house today was then occupied by Mr. and Mrs. Bide and family. Tho other two adjacent houses are similar and were probably built about the same time. 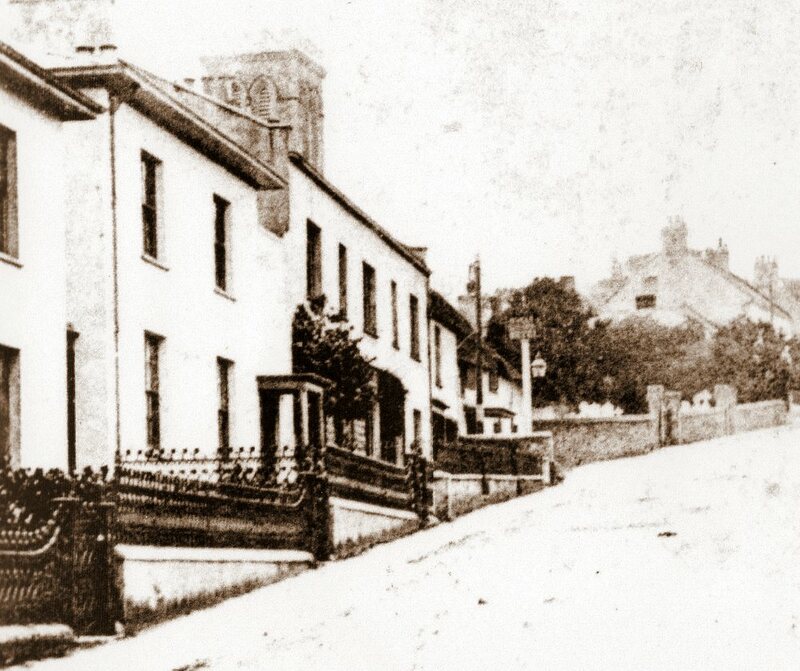 As Dunn had to supply a water pump for Miss Henning it seems that there were no former houses on the site, which was possibly Glebe belonging to the Church. If so, it supports the theory that Beech House was the former parsonage,which would have been built on Church land. Louisa Griffith from Gitsham, aged 55 Landed Proprietrs unmarried with Mary Lane Servant aged 53 from Warwickshite. william Greenslade 41 Clergyman without.. with family. Than John Hodges - Beech House? Apparently, one John Hodges added the shop and the family lived over it and in a room over out­buildings in the yard, with access being gained via external stone steps. It is probable that this latter structure still exists. From Pavey's account it would appear that butchers operated from these premises for well over a hundred years. The Frampton family were traditionally butchers. The brothers' grandfather was a butcher at Beaminster and a photograph from c.1909 appears in Gosling's ‘Beaminster', from the Towns and Villages of England series, in which their grandfather, Giles, can be seen standing outside the shop in the square with his two elder sons, Ernest and Charles and other staff. The brothers' father - also named Giles and also a butcher - was the third son of Giles of Beaminster. He had a successful business in Exeter until he died from pneumonia at the young age of 34. He had three sons Edgar Giles, Reuben Ernest and Ronald Charles. These sons took their second given names from their father and their Beaminster uncles. 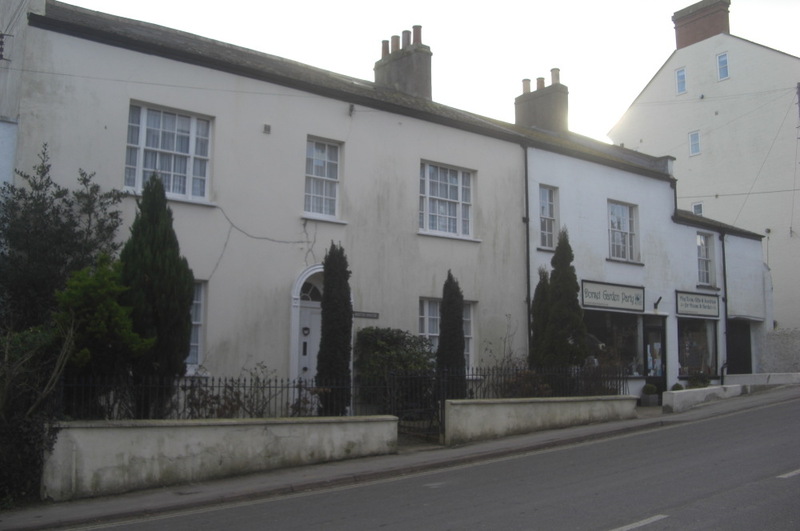 After the death of Giles, his widow and the three boys returned to her family home at Axminster. All three sons eventually became butchers and Reub learned his trade at Stewarts in Axminster in the days when use of a poleaxe was an important skill. Reuben then went to work for Harris in Lyme Regis and it was during this period that Ron was working for Marsh at Charmouth. It was at this time that Ron learned of the Marshes intention to sell and he and Reub together bought the business in 1938. Although qualified butchers, the brothers had little experience of buying and Reub confessed that his approach in the early days was to follow his old boss from Lyme and make one further bid af­ter Harris dropped out, much to the latter's irritation, but as Reub said, he'd got to learn. 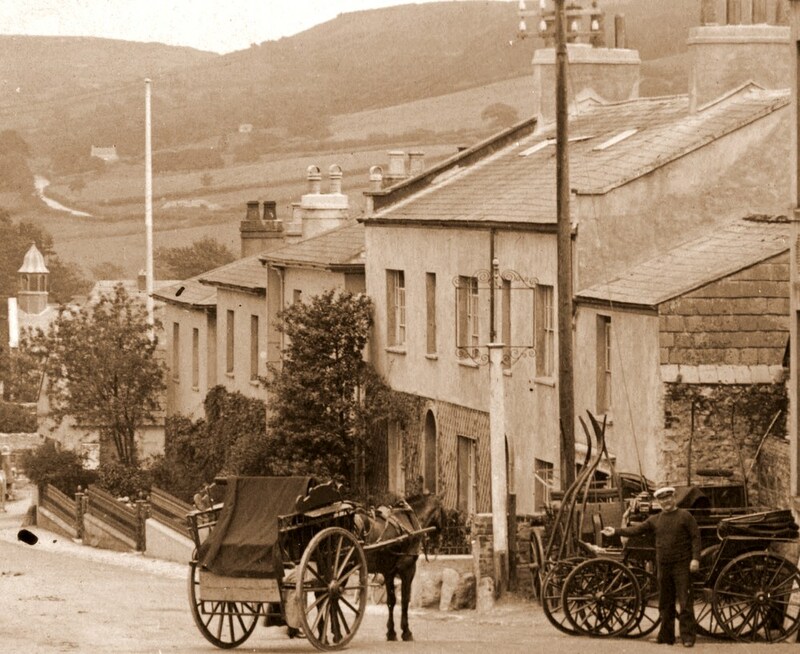 Whilst at Lyme, Reuben had married Aileen Rough whose parents had lived in Charmouth from around the end of the 19 th century, firstly at ‘Bow House', then at ‘Wood Farm' and finally at ‘Hogchester'. Aileen's father, Thomas John Frazer Kemp Rough, was a colourful character. 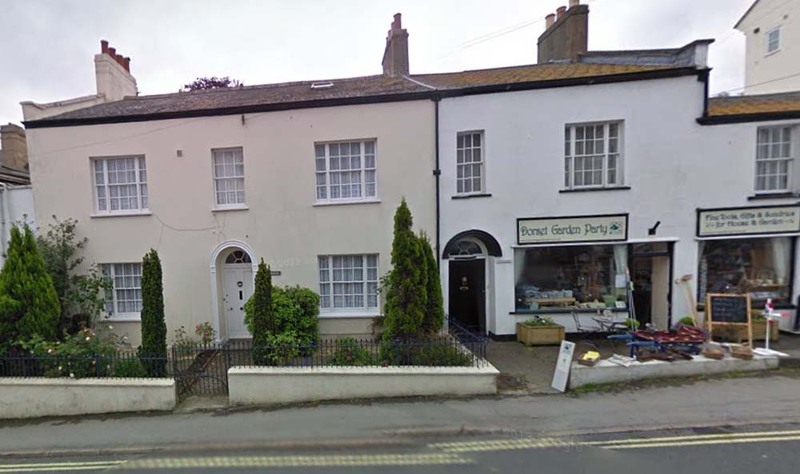 When single and working as a gardener, he lived with his parents at ‘Rose Cottage', which was next to the ‘Royal Oak' but is now a part of it and has been for many years. Later on, he worked as a dairyman/tenant farmer and moved from farm to farm over the years. Tom married Zelia Nina, the fourth daughter of Lambert Rendell and his wife Charlotte. In his early adult years, it seems that Lambert had moved to Guernsey and it was there that he met and married Charlotte and his children were bom. He later returned to England bringing wife, children and cattle! The family moved from Devon to Dorset where they also lived for a time at ‘Wood Farm'. 1871 farmer og 80 acres, was son rnning butchers at side. not on 1841 map. buyilt by pryers. 1854 Pryers built heritage centre. postman photo of back of beeces? Did Dunn own and rent them out. But he went bankrupt? The interior shows that formerly the two houses were one as on the ground floor part of the building seems to have belonged to the butcher's and the butcher's attic extends over Beech House. In 1892 Richard Hodges sold it to Richard Shelton who died in 1921 and it was purchased by Mrs. Haggard with right to use the garden door. In 1922 Godfrey D.N. Haggard, her son, became owner. He was father of Stephen who became famous as an actor but unfortunately died young. 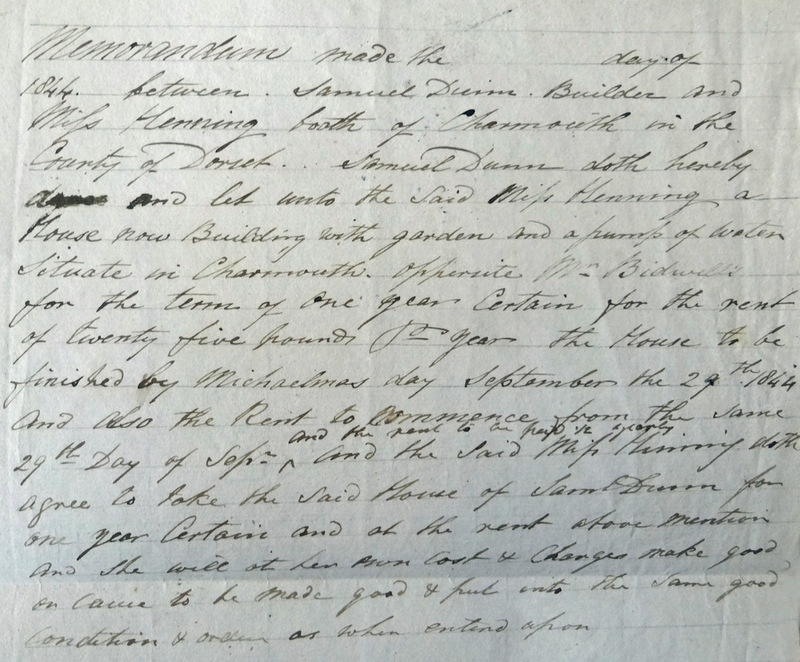 Memorandum made the.. day of ..1844 between Samuel Dunn, Builder and Miss Henning, both of Charmouth in the County of Dorset. Samuel Dunn doth herby .. and let unto the said Miss Henning a now building with garden and a pump of water situate in Charmouth opposite Mr. Bidwell`s for the term of one year certain for the rent of £25 per year. The House to be finished by Michaelmas day September the 29 th 1844 and also the rent to commence from the same 29 th day of September, and the rent to be paid yearly, and the said Miss Henning doth agree to take the said House of Samuel Dunn for one year certain and at the rent afore mentioned and she will at her own cost and charges make good or cause to be made good and put unto the same good condition and order as when entered upon. 1783 Land Tax List is shown below in bold type with relevant property from Map of Charmouth produced in the same year showing its value and area in acres, perches and rods. 1789 Thomas Edwards - House - 7s.7d. 1789 Richard Crout - House - Edwards & Davey - 5s.8 1/2d. 1790 Sun Insurance Policy for William Edwards, Butcher, his house being rented by Joseph Bradbeer, who was also renting the neighbouring 3 Crowns Inn from him. 1793 William Edwards - Self and Jones - 10s.7d. 1800 William Edwards - Self & Bradbeer - 10s.7d. 1800 Mrs. Crouts House - Self & Edwards - 5s.8d. 1800 Edward Farr - Lands - Self & Others - 4s.6d. 1805 Land Tax - William Edwards - Three Crowns - Self & Joseph Bradbeer - 10s.7d. 1805 Land Tax - William Edwards - Late Farrs - House - himself - 4s.6d. 1805 Poor Rates - William Edwards - Himself - Field - 2s.3d. 1805 Poor Rates - William Edwards - Himself -House - 4s.6d. 1805 Poor Rates - William Edwards - Late Farrs - House- 3s.0d. 1807 William Edwards - Mr. Hunter - Late Farrs - House - himself - 4s.6d. 1807 William Edwards - Three Crowns - Joseph Bradbeer - 10s.7d. 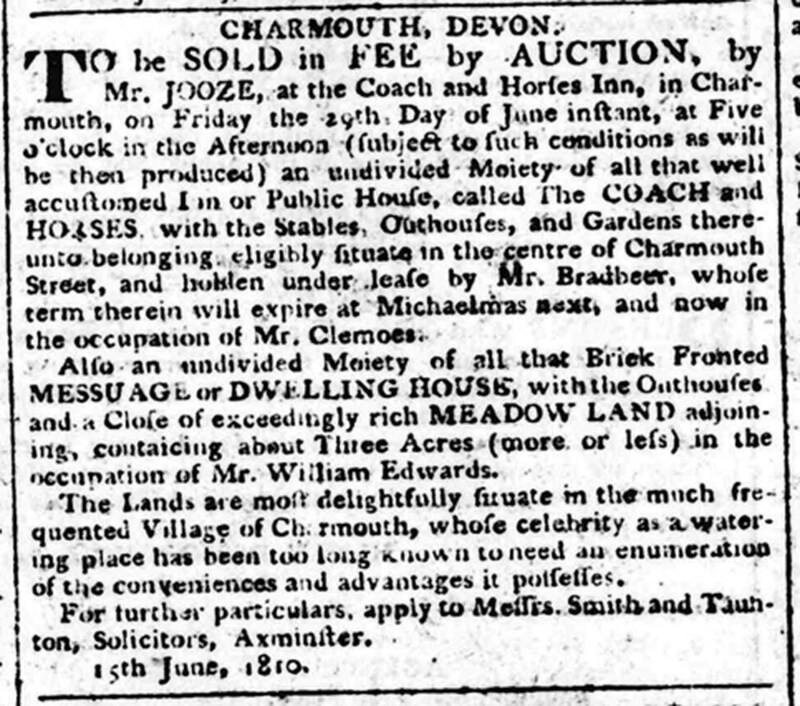 1810 This is an advert for the sale of the Moiety (half) of the Coach and Horses and Beech House , both owned by William Edwards. It is described as "a Brick Fronted Messuage or Dwelling House, with the outhouses and a close of exceedingly rich Meadow land adjoining, conatining about 3 acres ( more or less) in the occupation of Mr. William Edwards". This is the large field on the corner of Lower Sea Lane and the Street which corresponds with the later 1841 Tithe Map. 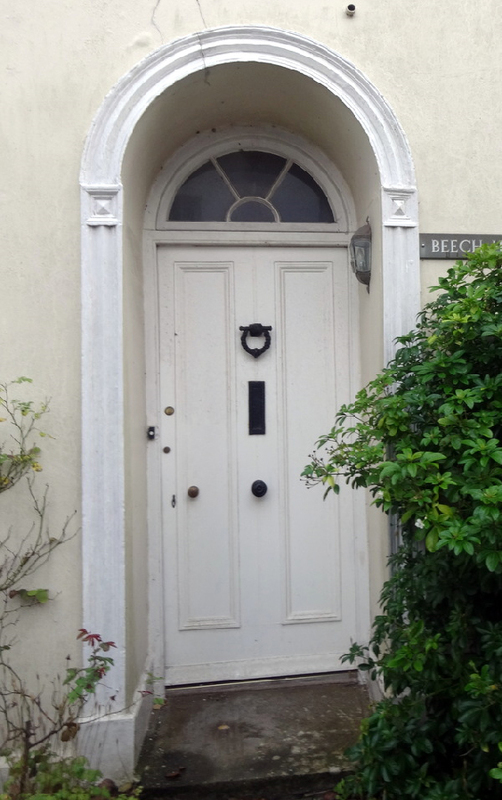 It obviously did not reach its reserve as William was to continue owning Beech House until 1829. 1830 Mr. Gundry - William Foss - Three Crowns Inn - 1s.7d. 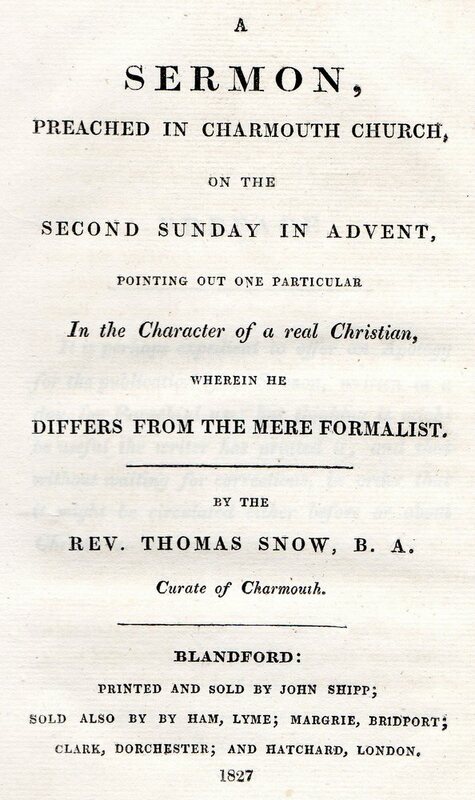 Isaac Cooke was Patron of Charmouth Church from 1826 until 1839, during the occupancy of Glover and Hales as Rectors. He lived in Clifton and was a Solicitor and at one time Mayor of Bristol. This was also where the Reverends Thomas Snow and William Glover originated from, as well as several other inhabitants. He bought Beech House from William Edwards and may well have rebuilt it at the same time as the Rectory as they are very similar as shown by the doorway illustrated here. The 1831 Poor rates show Isaac Cooke living and owning Beech House, with Thomas Snow living in the new Rectory and renting a field from him, which was probably the piece of ground Sandford House, Littlecote and Carrum House were later to be built on by Samuel Dunn. Isaac Cooke was only there briefly as the 1841 Tithe map shows it unoccupied and soon after John Hodges, the butcher moves in and opens his shop in the adjoining Winton House. In 1835 Isaac gave £100 towards the building of the new Church, the largest amount donated. He died in 1852 aged 81 at Windsor Terrace in Clifton. His son, of the same name continued in his business and was Mayor of Bristol in 1857. An advert below shows their involvement with promoting one of the many Railway companies attempting to link Charmouth with Bridport & Lyme Regis. The 1831 Poll Book shows Isaac Cook, an Attourney at Law living in Clifton, Bristol renting Beech House to Thomas Snow. 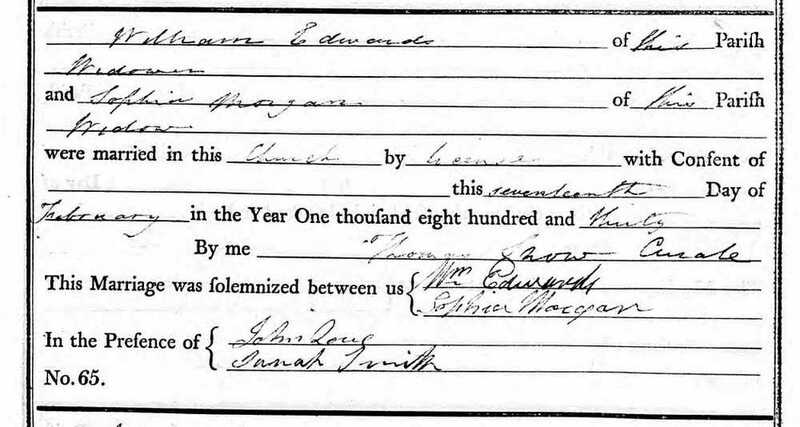 1830 marriage of William Edwards, Widower to Sophia, widow of Thomas Morgan, former lanlord of The George Inn. 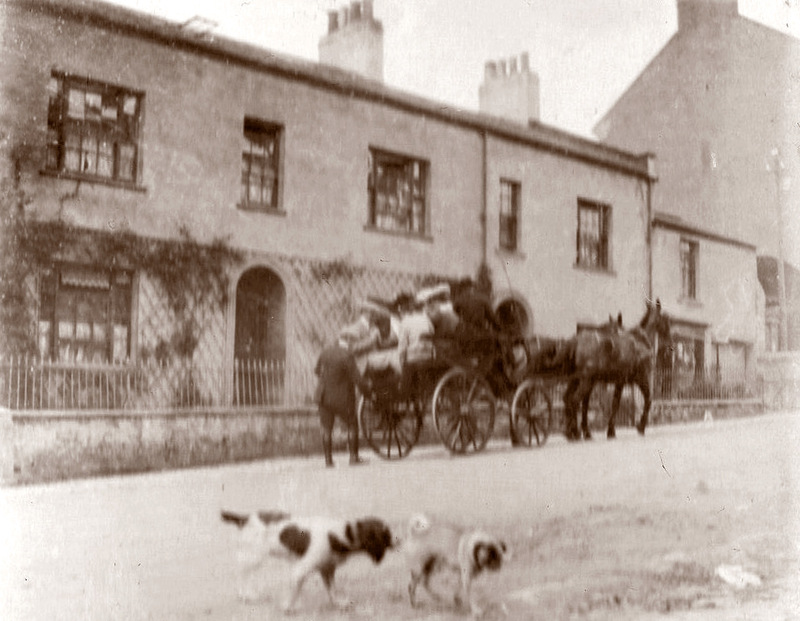 William Edwards (Butcher) also owned Beech House and the Coach and Horses through inheritance. 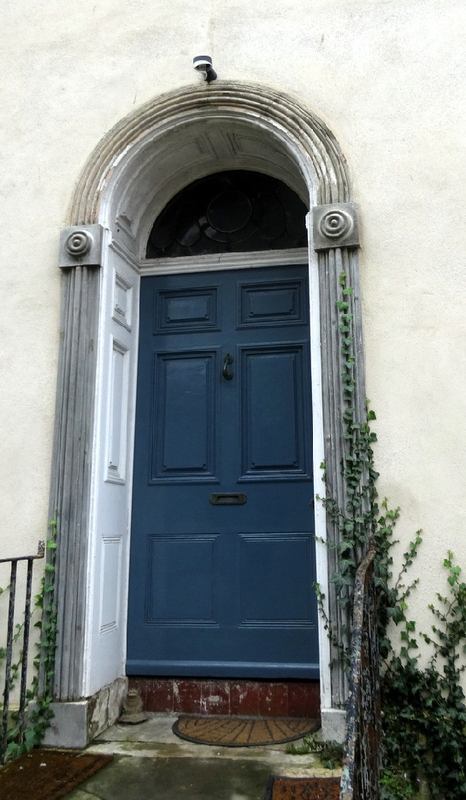 The Poor Rates show that in 1829/30 he sold this property to Isaac Cooke, An Attorney from Clifton in Bristol. William appears in the Parish records as a widower in 1830 and marries Sophia, also a widow from the village and moves from it. He also sells the Coach & Horses.